Daughter and I are going on a hike tomorrow and bringing along a lunch. I’ll leave it in a cooler at the bottom of the mountain, but what can I bring that will satisfy my hunger, taste great and not taste boring? I had an “aha” moment in Trader Joe’s when I saw the pignolis (pine nuts). 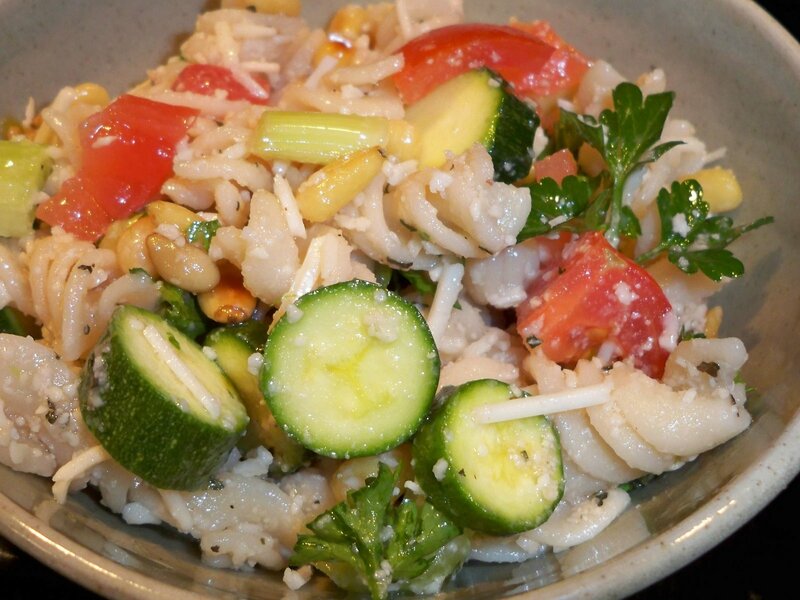 Why not make a pasta salad with toasted pine nuts? Yum. There’s no mayo, so letting it sit in the cooler for a few hours works fine. 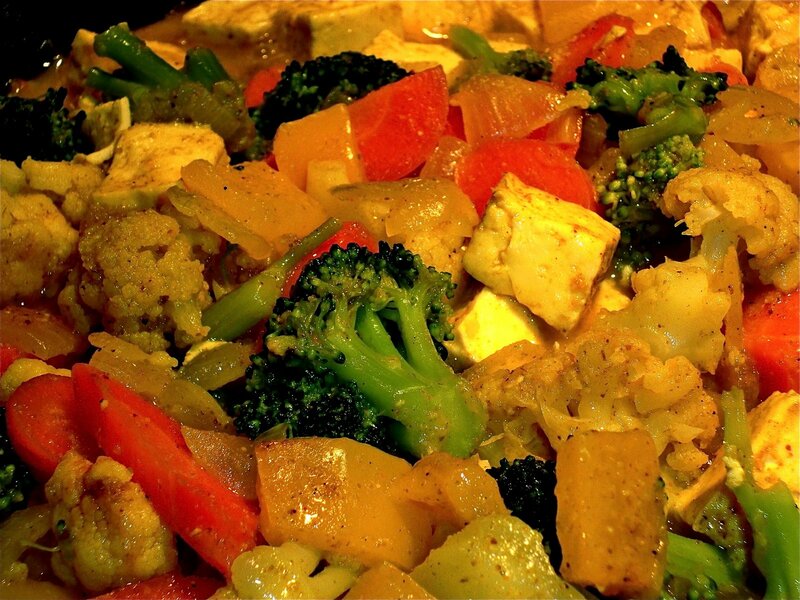 With lots of fresh, crunchy veggies, it’s sure to satisfy after a long hike in the desert. Of course, Daughter and I had to eat it for dinner too, just to make sure it was good. The pine nuts give it a wonderfully nutty flavor, and the veggies give it a crisp and light taste. I love fresh herbs, so please use the fresh parsley. Dried parsley just wouldn’t give it the fresh, spring taste. But feel free to add any fresh veggies you want and substitute anything. I adore crispy, fresh baby vegetables, and with the farmers’ market overflowing with great veggies right now, you can’t go wrong. I found the fennel and tomatoes there last weekend. Can’t wait to go back and find out what else I can make next week. As I write this, I realize that since I’m in Arizona I forget that the rest of the world isn’t having 80-degree weather with sunny skies and farmers markets on the weekends. I know so many of my friends are shoveling themselves out of snow and trying to find anything green outside. If that’s your situation, I wish you a nice, warm, cozy fire to sit by and a good movie to watch. And have some pasta salad while you’re at it. Ratio is 2/1 for oil and vinegar totaling about 1/4 cup. Then just add herbs and spices and taste. I don’t like my dressing with too much vinegar, but some people do. Just add a little more of each till you have it just right. Depending on what veggies you use, you may need a little more. 1. Start out by cooking the pasta as directed. When it’s done (al dente), drain and quickly rinse it in cold water to stop any further cooking. You don’t want mushy pasta salad. 2. In a frying pan without any oil, toast the nuts lightly over medium heat. Stir often and when they turn golden brown, remove from pan to prevent burning. I burned the first batch, so be careful, they go from brown to black quickly. 3. Once the pasta has cooled, add the veggies, cheese, nuts and dressing. Mix thoroughly. I saved a little of the dressing for tomorrow since it usually soaks everything up overnight. While at a party recently, I was eyeing the little brownie bites on the buffet and kicking myself since I can’t eat those anymore (and glad I couldn’t eat the calories). But a little light bulb went off above my head–why not make my own brownie bites? Using a recipe similar to the flourless chocolate cake Daughter makes, and tips I found online, we came up with a great little brownie bite tonight. Daughter took over and made them while I whipped up some garlic, pepper, tomato and mushroom pasta. After eating way too much pasta because I love it so much, I then proceeded to eat way too many brownie bites (we all did)…they are chewy on the inside, crispy on the outside and so chocolaty. I’m so excited that we now have an easy, bite-sized dessert to share when guests come over (and it just so happens they are coming tomorrow). 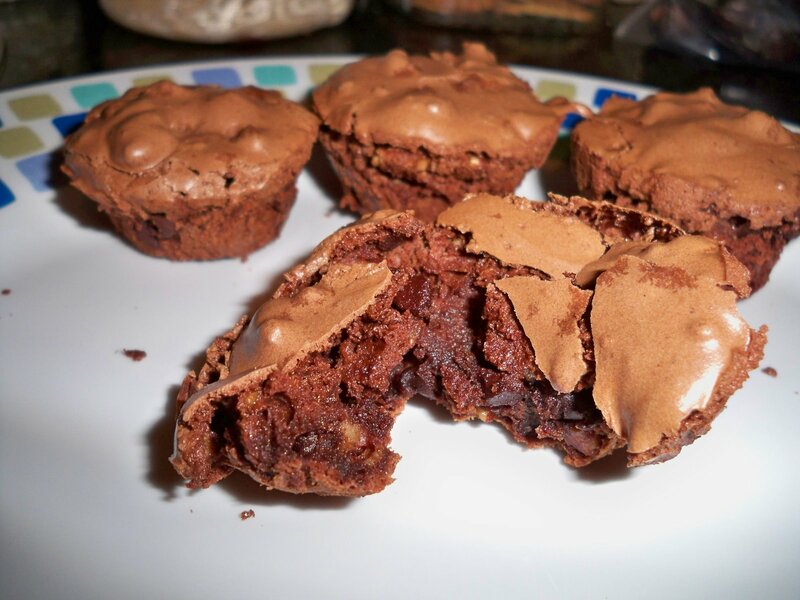 I used a mini muffin pan that I bought a long time ago. If you can’t find one, you can buy the aluminum mini tins at Safeway or just use a regular muffin pan, but I wouldn’t fill them up. I would fill it just 1/2 way so they aren’t too thick. Then adjust your cooking time accordingly. 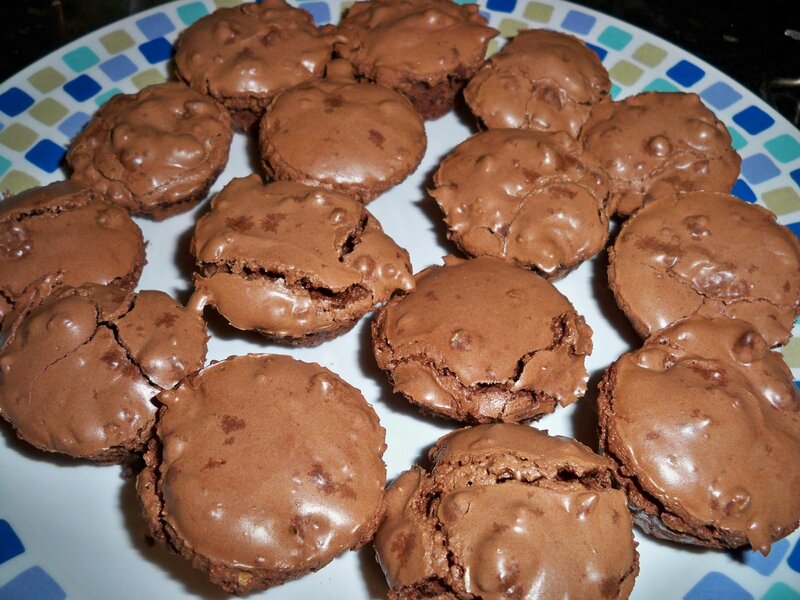 Daughter took this photo to show how great they are inside…yum! 2. Combine powdered sugar, cocoa powder, and salt. Mix with a fork to combine. 3. Using a mixer (I use an old hand mixer, but you can use a stand mixer) add egg whites slowly as you mix on medium. Keep mixing for about 5 minutes or mixture is thickened. 4. Stir in nuts and chips. Mix thoroughly. Mixture should be very thick. 5. Pour into tiny muffin tins, which have been sprayed with nonstick spray. Fill each cup about 3/4 full. We made 36 bites from this recipe. 6. Bake for about 15 minutes. Tops will crack but be careful not to undercook or the bites will be mushy inside. Note: I would use less nuts next time, since I’m not a big nut fan. But I love, love, love these and I’m not complaining. I ate way too many tonight and will eat more tomorrow. Then I’ll have to make more with all kinds of tests such as raspberry, mint, orange, no nuts, more chips, white chocolate chips, etc. The possibilities are endless. I recently visited the downtown Phoenix farmers’ market for the first time. I expected to see a lot of produce, locally grown of course, but I was so surprised at all the other wonderful things. And so many of them gluten free. It was wonderful. 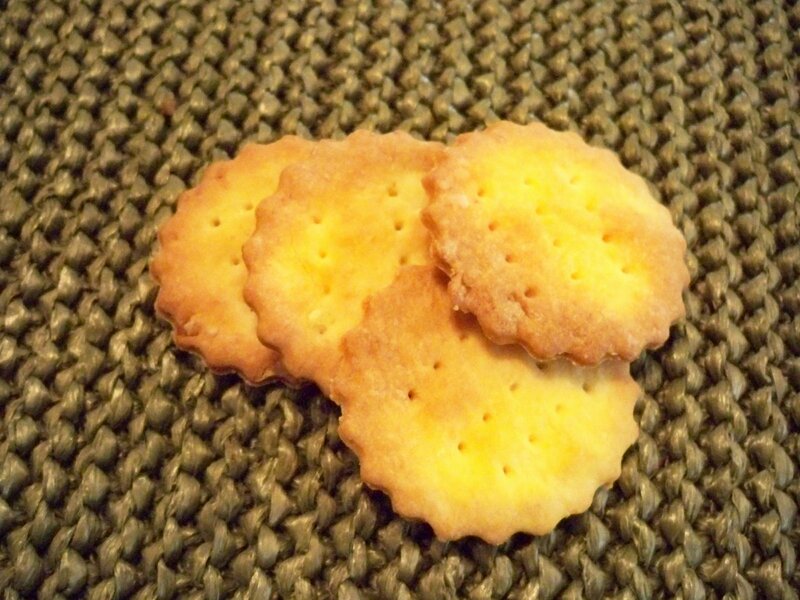 Among my many finds (which I’ll write about in future posts) were two kinds of GF crackers. And anyone GF knows that finding a good GF cracker is like finding the perfect pair of jeans. Many look great, but upon closer inspection they aren’t so great after all. These two actually fit the bill and made me so happy that I went, even though it was very early for me on a Saturday morning. And anyone who knows me well knows that I am not a morning person. 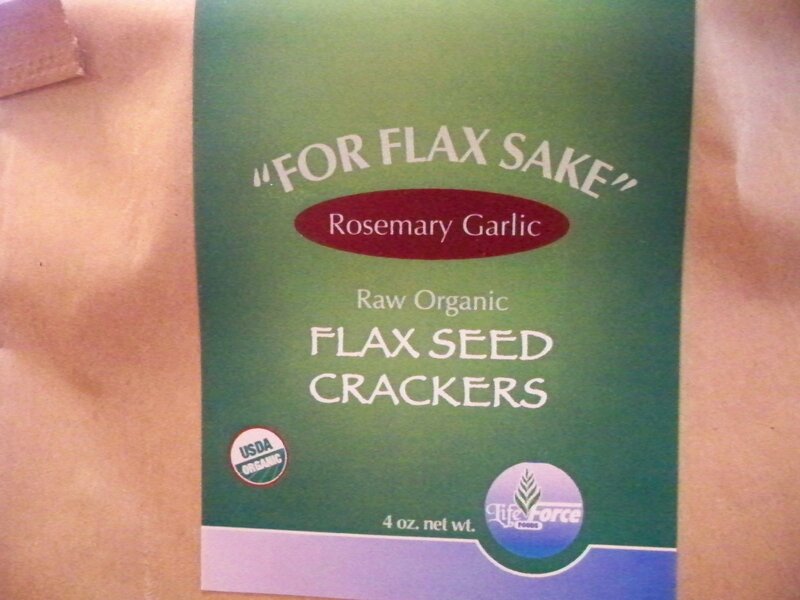 The first cracker is made by “For Flax Sake.” They had three different varieties–one with rosemary and garlic, one with cranberry and fruit flavors, and another with chili powder (although so little it’s hard to taste it. It’s the mildest of the three.) 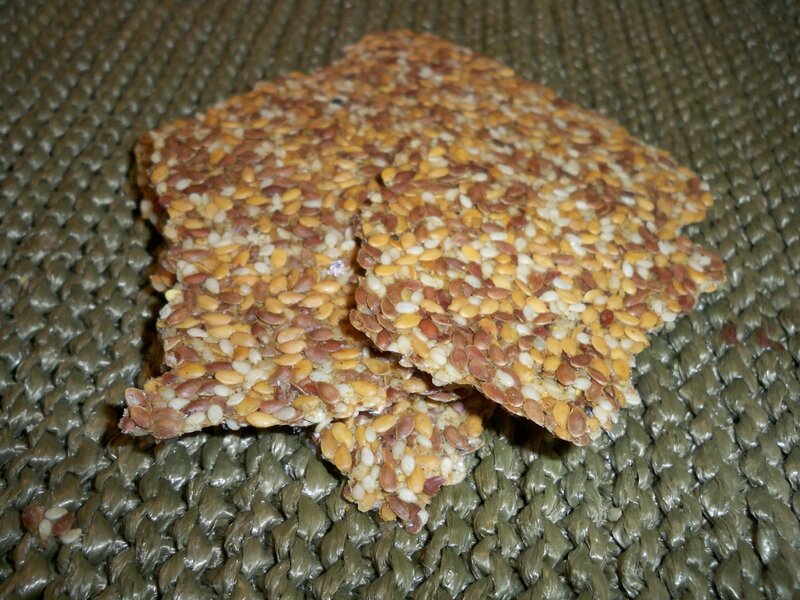 The company producing the crackers is Life Force Foods in Gilbert, Arizona. The ingredients were almost too simple: Organic brown flax, organic golden flax, organic sesame seeds, garlic, rosemary and spices. Assured they were gluten free, I tested all three. I ended up buying the rosemary/garlic flavored crackers. They have a wonderful crunch and powerful rosemary flavor. I imagined them with a mild brie or swiss. Or even just snacking on them for the flax benefits. They are in big, flat slabs and you can break off pieces. Yummy, herb-infused flavor with a hint of garlic. I think I’ll have some with a good veggie soup also. The next cracker was a complete surprise. I was actually testing the goat cheese at the “Fresh From Rowie’s” booth (which was fabulous). The company is in Glendale, AZ and I love that the goats are hormone and antibiotic free, as well as treated humanely. I saw a small note on the bottom of the sign that stated Gluten Free Crackers. 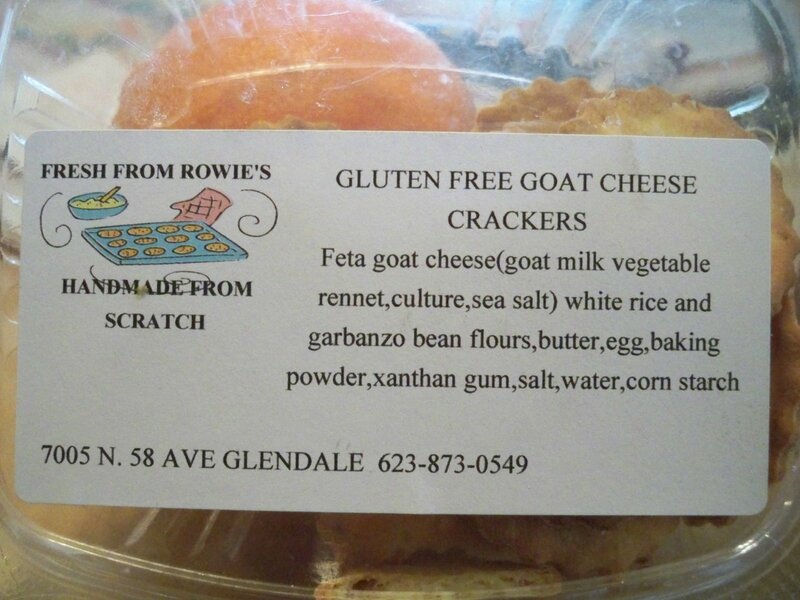 It turns out the owner’s husband is gluten free and they designed the crackers out of goat cheese, rice flour and bean flour. They are crispy with a great cracker texture. The flavor has a hint of goat cheese, but not overpowering. These do have salt in them, so try a mild cheese with them. Once again, I can’t wait to eat these with cheese or a great veggie soup. I think these would be wonderful with a pea or black-bean soup also. They are sturdy enough to hold things too, if that’s your preference with crackers. What a joy to find something so great when I wasn’t even looking for them. Both are local companies to the Phoenix area (although not in Phoenix) and I’m excited that when I run out, I won’t have to order online or pine away for the loss. They are just a Saturday away. If you’re in the Phoenix area, I urge you to give these a try and to visit the farmers’ market. It’s a great way to spend the morning and you’ll be supporting local businesses, which is always a good thing.